Test pumps serve as pressure generators for the testing, adjustment and calibration of mechanical and electronic pressure measuring instruments through comparative measurements. These pressure tests can take place in the laboratory or workshop, or on site at the measuring point. The model CPP700-H and CPP1000-H hand test pumps have been specifically developed for test pressure generation on site. By connecting the test item and a sufficiently accurate reference pressure measuring instrument to the test pump, on actuating the pump, the same pressure will act on both measuring instruments. By comparison of the two measured values at any given pressure value, a check of the accuracy and/or adjustment of the pressure measuring instrument under test can be carried out. The CPP700-H and CPP1000-H hand test pumps, despite their very compact dimensions, enable simple and accurate pressure generation of up to a max. of 700 bar (10,000 psi) or 1,000 bar (14,500 psi) respectively, with an integrated switching from system pressure to high-pressure generation. For the precise setting for accurate comparative testing, the pump features a fine adjustment valve. As a pressure transmission medium, either hydraulic oil or clean water, free of calcium carbonate, should be used. 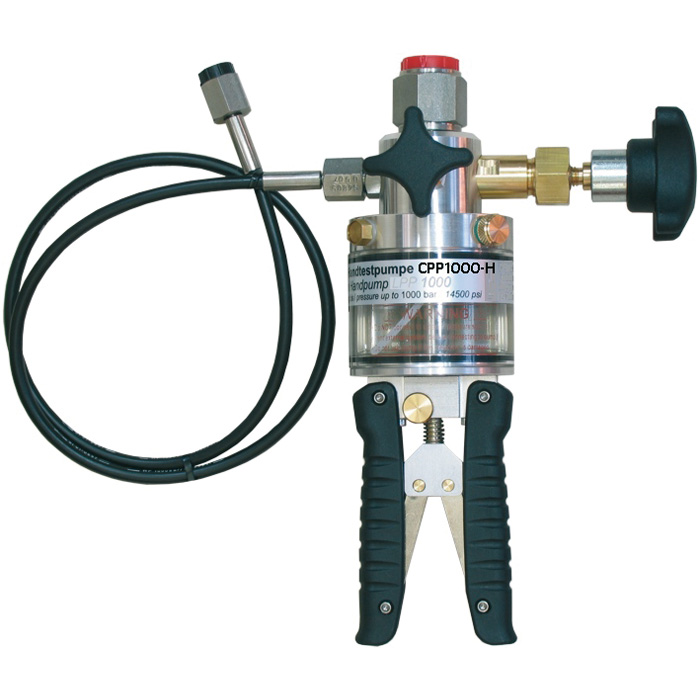 The reference instrument is screwed directly to the top of the pump, and the test item is connected using a connecting hose with a G ¼ female thread, included in delivery. 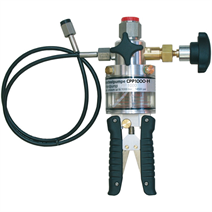 The CPP700-H is delivered with a Minimess® 1620 test item hose system as standard.